The author tells us in the preface that he decided to write this book because of the millennium inspired rush to find the hundred greatest songs, movies etc. Why not stars? Why not indeed! The format of the book is that each star has a double page to itself. An illustration and summary of its vital statistics appears on one side, and a self-contained essay about it on the other. Apart from the Sun which, because of its special place in our affections, appears in a place of honour as star zero, the remainder are dealt with in alphabetical order. What a collection they are! Some stars are there because their study has illuminated important issues in stellar physics or cosmology, some are there because they represent important classes or types of stars, some are there because they are simply pretty when looked at through a telescope, some are there because they are so bright that it's difficult to miss them, some because they are old, some because they are speeding through our neighbourhood at a considerable rate of knots, and some because they have important historical or cultural significance. At least one is there because it has a really silly sounding name! 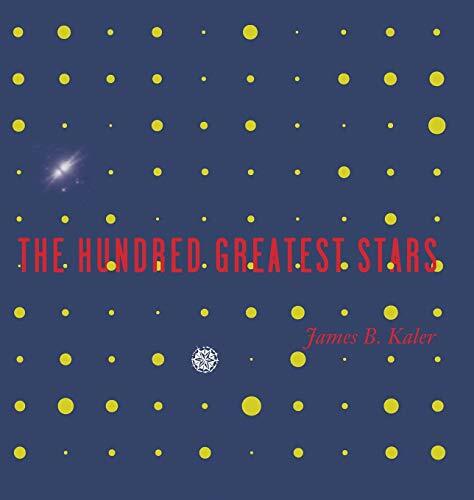 You may be thinking that to order your greatest 100 (or should I say 101 stars when we include our star zero, the Sun) stars in alphabetical order is a bizarre way of going about it, and it is true that reading straight through the book can be a bit bewildering for those who like to have some guiding thread or theme. However what it does do is to emphasise the sheer variety of stars and star systems, and to celebrate the richness of our understanding at the end of a century that saw their secrets unlocked. There are several appendices in which the author lists the stars differently, by evolution or by sky position, and so you could if you wish follow a different path through the stellar garden. He also provides an introduction to some of the basic concepts of stellar physics, and a useful glossary of terms. For me, reading this book brought back some happy memories of student days when summer nights were often spent with my eye glued to the eyepiece of my university astronomical society's telescope. I found many old friends, and I made many new acquaintances which made me rue my present lack of a telescope. Whether you want to get an idea of the wonders of stellar diversity, to find examples of specific star types, or to marvel at what a century of stellar physics has taught us, I can thoroughly recommend this book. When you've read it, sit back and try and decide if you agree with James Kaler's choice. I did, and I have to say I think he's done a brilliant job!